1. What is a Member Choice Club? The difference between a standard wine club and a member choice club is that the winery allows wine club members to modify the contents of their club shipment prior to the order being committed. Before online wine club software existed, offering this type of flexibility to customers was very labor intensive and resulted in many phone calls and email exchanges. With the advent of online club management systems, it is now possible, and surprisingly easy, to offer members a member choice club option. Members can simply log in to a web portal and edit the contents of their next club order. 2. What are the advantages of having an online member choice club? In essence, the clear advantage is greater customer satisfaction! Many club members relish in having the option to choose their favorite varietals. Increased customer satisfaction leads to happy members and reduces club member churn. If you are offering an offline member choice club, you'll notice a significant reduction in customer service and a smaller margin for human error. 3. What types of controls do I have as the winery? Whether or not members can opt to skip a shipment. Which wines are available for member choice club orders. A minimum bottle requirement for the club shipment. A minimum order price for the club shipment. 4. I use your software now to manage my traditional wine club. How do I transition to making it a member choice club? Transitioning is surprisingly easy. You simply need to configure some custom club preferences in Orders / Order Preferences / Pending Order Preferences. Your Account Manager will be happy to talk you through best practices. When completing a member choice club order, be sure to check the member club order and set an activation date. You may also set opt to set a bottle minimum and dictate whether or not a shipment can be skipped (Allow Customer Cancelation). 5. If customers do not modify their orders, what happens? 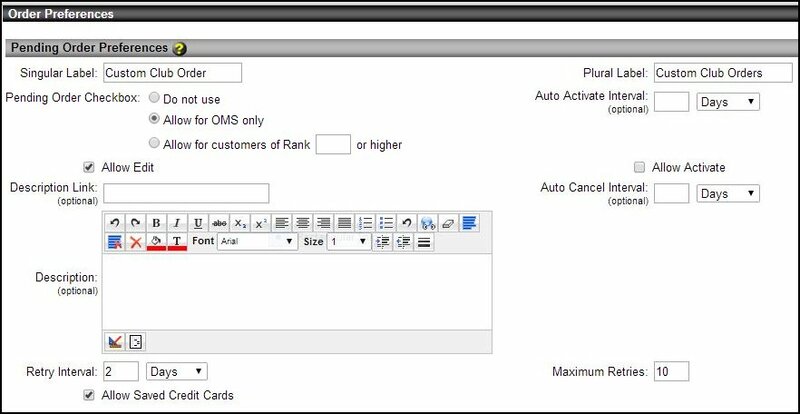 If customers don't modify their custom club orders, the system will auto activate those orders on the specified activation date. The activation process changes the order statuses from "pending" to "unshipped" at which point you can process the order like a normal wine club order. 6. When a member choice club order is placed, is inventory decremented at that time? If you are using the inventory control feature, when the order is in pending status, inventory is not decremented. When the order is changed to active status, inventory will be decremented.